All signposts which might be helpful to parachutists landing in Britain taken down. Unemployment in BritainÂ falls 92,000 in May to 881,000, giving a total fall of 611,000 in a year. German onslaught continues at Dunkirk. General Lord Gort, C-in-C BEF, returns from Flander’s with anotherÂ 64,400 troops who were evacuated off the beaches this day. However, in future, the evacuation will only continueÂ during the hours of darkness due to the high losses of warships to daylight air attacks. British forces evacuate the Bodo area of Norway, 120 miles S-W of Narvik. The British destroyers Keith, Basilisk and Havant and the transport Scotia are sunk by Luftwaffe diveÂ bombers, near Dunkirk. Luftwaffe raids industrial centres in the Rhone Valley from Lyons to Marseilles. Clothes rationing introduced in Britain. The Luftwaffe carries out a night raid (110 bombers) on Manchester. The heavy cruiser Prinz Eugen arrives in Brest. The German’s secure Crete and the British evacuation is completed, with 17,000 British, Commonwealth and Greek troops being rescued, although the Australians lose more than half their contingent. Final figures for the British are 16,500 killed, wounded or captured, along with a large number of warships sunk or damaged, while the Germans lose about 6,200Â men. Stukas sink the British cruiser Calcutta off Alexandria. British forces enter Baghdad and reinstate the Regent. America begins sending Lend-Lease materials to the Soviet Union. Convoy PQ-17. Mexico declares war on Germany, Italy and Japan. Himmler is put in charge of the German ARP system. The siege of Sevastopol by the 11th Army continues with a round-the-clock bombardment by heavy artillery andÂ Luftwaffe bombers. Hitler arrives at Poltava, the HQ of Army Group South to approve Field Marshal von Bocks plan for the main offensive. A high level plan had been prepared to make the Russians believe that Moscow was still the objective, Â Goebbels organised leaks to this effect to the foreign press while Army Group Centre made overt preparations forÂ an offensive under the cover-name of ‘Kremlin’. Jews in Belgium, Croatia, Slovakia, Romania ordered to wear yellow stars. Rommel takes the fortified ‘box’ that is held by the British 150th Brigade in the Gazala defensive line andÂ secures the ‘Cauldron’. This enables him to get much needed supplies flowing. Rommel now turns the German 90thÂ Light Division and the Italian Ariete Armoured Division against Bir Hacheim in an attempt to wipe out the FreeÂ French garrison which still holds out. He also distracts the British by sending the 21st Panzer Division northeastÂ to operate nearer to Tobruk. Eden announces that Empire casualties in first three years of war are 92,089 killed, 226,719 missing, 88,294Â wounded and 107,891 captured. The British actor Leslie Howard, flying back to Britain from a five-week lecture tour in Spain and PortugalÂ boosting the Allied cause, is killed when his DC-3 airliner is shot down by German fighter planes over the Bay ofÂ Biscay. Although it came to be believed that the real target was Howard’s manager, Alfred Chenhalls, who bore aÂ passing resemblance to Winston Churchill, it now appears certain that Howard was the actual target. Alerted toÂ Howard’s presence in the Iberian Peninsula by German agents, Nazi Propaganda Minister Joseph Goebbels had orderedÂ the plane shot down in order to silence the outspoken anti-Nazi actor. The allied 2nd Tactical Air Force is formed in UK. BdU (C-in-C U-boats) adopts a new policy of fighting back at Allied sub-hunting aircraft with the U-boats’Â own AA guns while crossing the Bay of Biscay on the surface. This tactic proves to be largely unsuccessful and isÂ soon abandoned. The Red Air Force attacks German rear communications and airfields at Smolensk, Orel and Bryansk. The British Eighth Army captures Frosinone to the South East of Rome. Byrnes and Committee advise the President to drop the bomb. 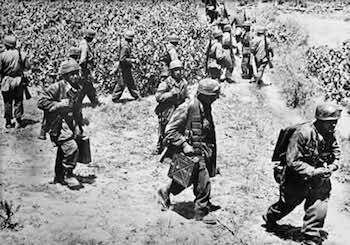 U.S. troops make new landings on Okinawa as forces from the East and West coasts link up South of Shuri.